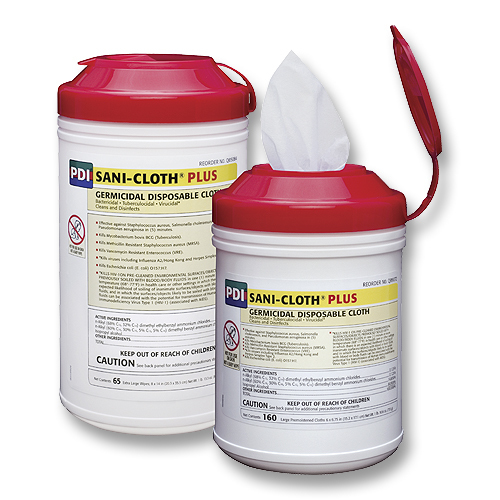 PDI Sani-Cloth Plus Wipes clean and disinfect hard surfaces without irritating your hands. Ammonium chlorides in 14% isopropyl alcohol quickly kill Herpes, HIV-1, TB and other organisms. Fresh scent. 6" x 6 3/4". EPA registered. Compatible with a broad range of hard nonporous surfaces and equipment found in healthcare environments. Pre-saturated with the correct amount of germicidal solution -- reduce waste and save time. Meets CDC, OSHA and CMS Tag F441 guidelines. Available in multiple sizes and formats to meet the various needs of your facility. See "Sizes & Formats" tab to learn more. Point of care accessories and tools are available to help improve staff compliance to facility protocols. See "Accessories & Compliance Tools" tab to learn more.